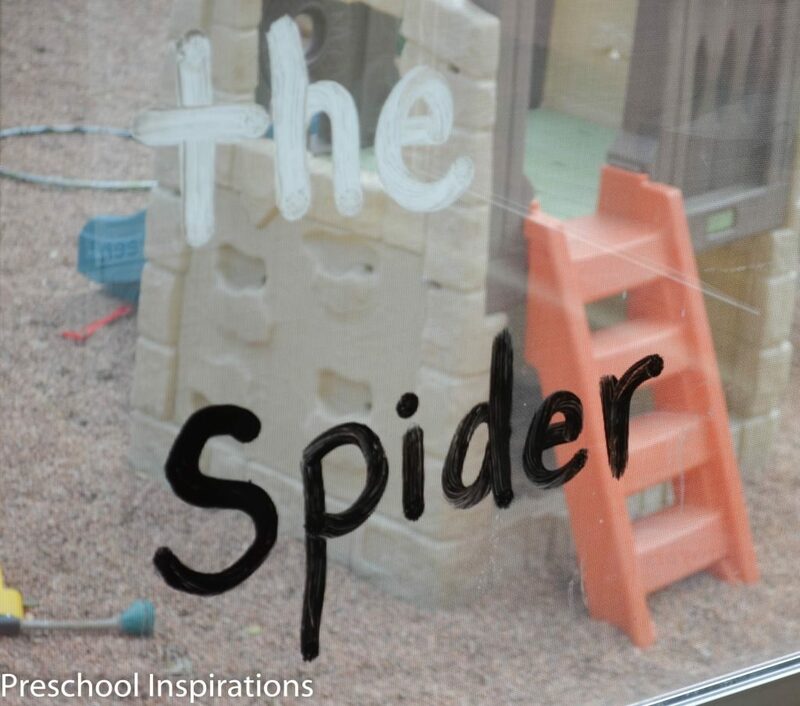 Window writing is a great way to work on literacy skills on a vertical surface! For awhile now I have been trying to come up with a good place and method for a word wall. I wanted something that would stand out in my preschooler’s minds. I have spent months looking through school supply stores for “the perfect word wall.” One night while I was at Mardel (a local school supply store), I picked up every word wall they had, tried to picture where it would go, and how I would use it. Discouraged, I put them all back. Even with their huge assortment, none of them had the “it” factor that I was looking for. Part of my wall dilemma is that I don’t have big wall spaces. I have lots of windows as well as storage spaces such as built in bookshelves and cubbies that take up a lot of wall area. The other aspect is that I want all text in my classroom to be meaningful. I was that crazy student in high school and college who went home and retyped my notes from school that day, then color coded them. Color coding my notes really helped me to sort through the information, and while I was taking a test, my memory was able to retrieve the area that I studied by color and content, instead of just content. I wanted to be able to do this for my students too since I know that word walls can be completely hit or miss, depending on the student. Whatever I can do to make learning more meaningful is a win for both of us! So after giving up on the traditional word wall, I started looking to my windows. And then I realized that they could be my word wall! This completely solved all of my problems, and the best part — the students are learning SO much from them! 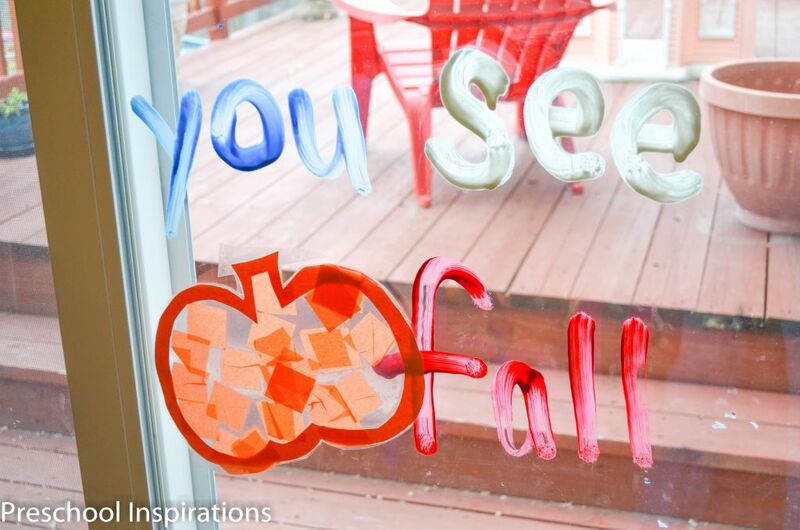 I found a pack of window markers called Window Writers and got to work painting words all over! Not only do I have just words on my word windows, but they are strategic as well. In my dramatic play area is this menu. I love that it shows the class the various forms of writing: upper case and lower case letters, numbers, and symbols. Another fun part is that we can trace them too. The paint leaves a thin texture on the windows, which adds a slight sensory element as well. 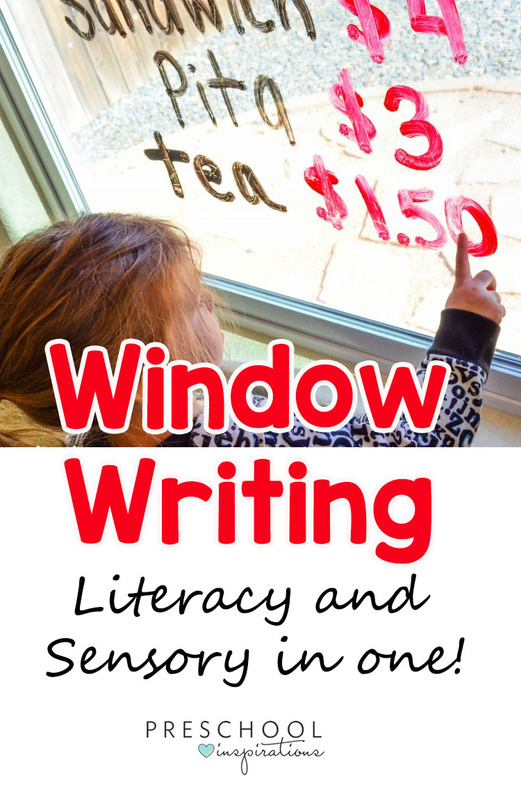 I am so excited for our window walls as they have been the most successful tool I have used to help reinforce words and teach sight words (for those who are ready for them). They are so enthusiastic to learn our new words, and I am always surprised at how well they remember the words we are reviewing. Free hand art is not my strength, if you couldn’t tell :). So far the clean up has been very easy, which I know is not true of all type of window markers. All I have to do is wipe them with window cleaner and a paper towel, and it comes off with ease. The type that I use are available at Hobby Lobby and Amazon. I was lucky enough to find someone selling them from a consignment page. I don’t plan on being able to find a whole pack for $3 again, but I will certainly be investing in more in the future! This is so cool! I have seen that type of marker in stores and have always wanted to come up with something fun to do with them! I like the letter tracing/sensory aspect too! My daughter is not quite at the sight words level but tracing letters would be perfect for her! It is so fun Laura, so I hope you and your daughter enjoy tracing with them! I appreciate you stopping by and the kind words! Awesome! I love this idea! The whole back of our hose has large windows and sliding glass doors! 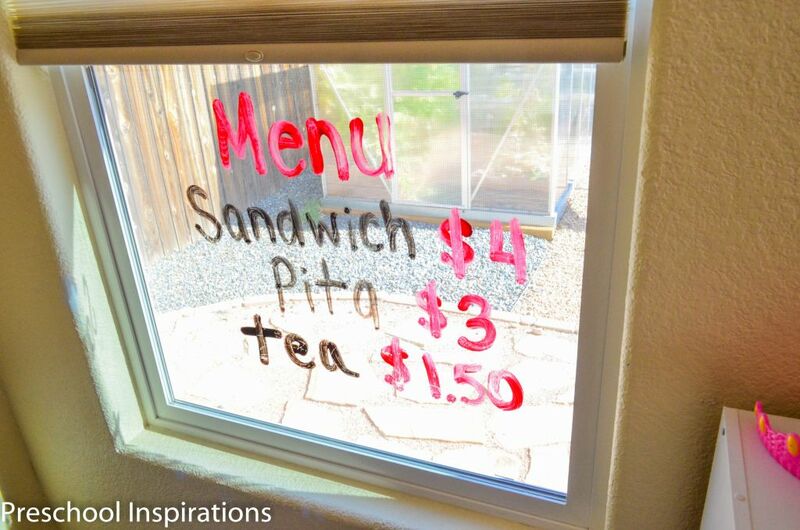 I love using them for things like our Thankfulness Tree, but never had I thought about window writers! Thanks! And thank you for linking up at Makeovers & Motherhood’s Welcome Party Wednesday Link-Up! Thanks Makeovers & Motherhood! Your Thankfulness Tree is such a sweet and wonderful idea. 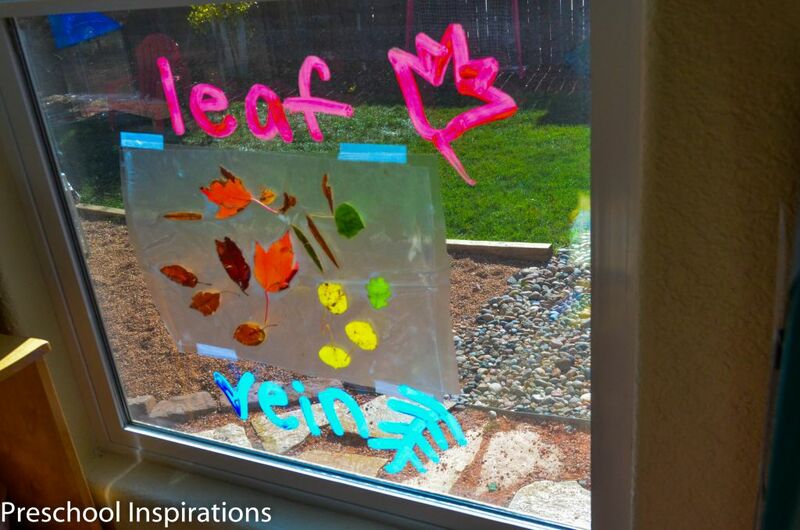 Thanks so much for stopping by, and I hope you enjoy some extra “learning decor” on your windows!